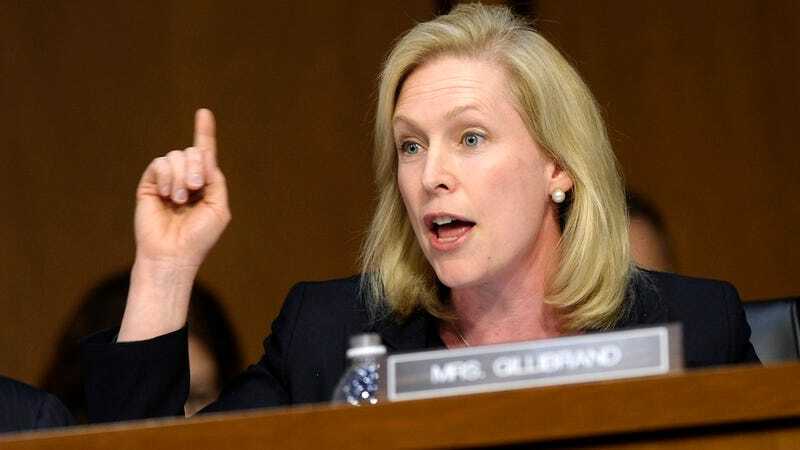 Senator Kirsten Gillibrand, badass champion of women's rights as she is on the Senate floor, is often asked to dispense advice to woman when she's not on the Senate floor. Her most recent tidbit of impromptu advice, though, was a little... confusing. This issue of likability. For a lot of young women, they want to be well-liked. If they're too aggressive, or too pushy, or too declarative, they won't be well-liked. [...] To meet those standards, you have to speak less like a young girl and more like a young, aspiring professional. It's part of our nature. It's not a bad part of our nature. [But] it's a choice every young woman is going to have to make about how she wants to be and how she wants to be received. To echo Slate's Katy Waldman: Wha? Do women "naturally" want people to like them, or are women simply taught that the only way to navigate existing power structures is to kiss up to the people in charge until they're deemed too nice to advance any further? Is playing into the patriarchal bait-and-switch a natural thing that women do? What's with the "feeding everyone at the table" business? Is it possible that a Senator speaking extemporaneously worded something less carefully in speech than she would have in writing?